Wipe the 303 Aerospace Protectant on any vinyl, rubber, plastic or leather surface and you'll instantly have a richer looking finish with valuable UV protection. The 303 Aerospace Protectant Wipes contain the same formula as the popular spray on version, but now you can simply wipe them on to any surface. This can save time and you will not have to use a microfiber towel anymore. Simply wipe down the desired surface and throw out the used wipe! Each container contains 40 pre-moistened wipes that will leave your car clean and protected. 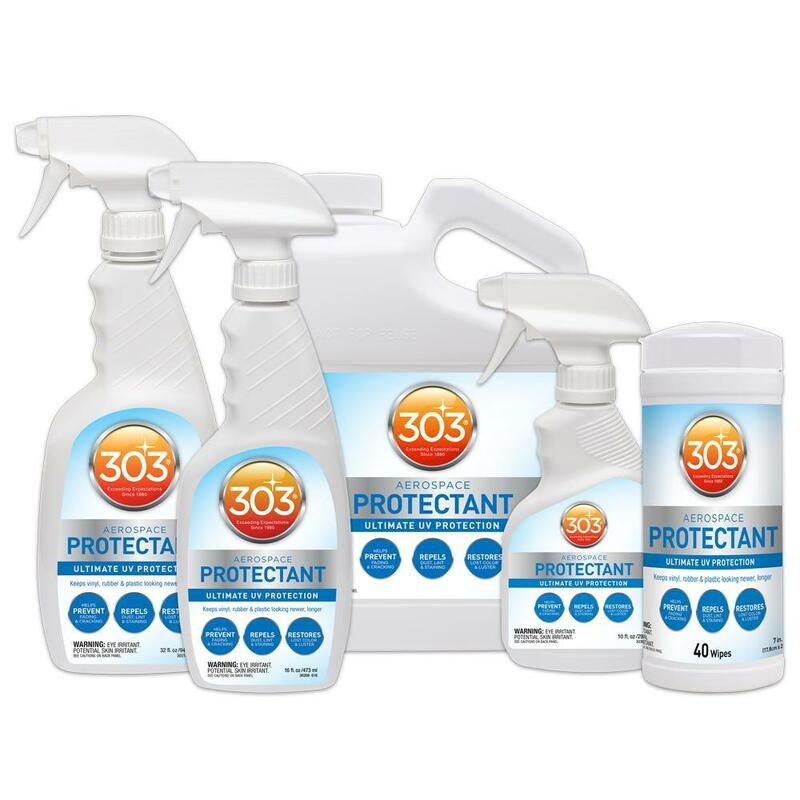 The 303 Protectant Wipes are great to use on your vehicle's rubber (tires, seals, hoses), vinyl (dashboard, doors, armrests, interior and exterior trim, engine casings, convertible tops), plastic (car bras, gauges, grills, trim, convertible's soft windows), leather (seats, trim) and so much more. This versatile product gives all of these surfaces valuable conditioners and protection that will keep each surface looking new and fresh for years to come with regular treatments. The tires, leather seats, exterior trim and dashboard often get prolonged exposure to harmful UV rays so it's important to thoroughly protect those surfaces the most. Many other dressings are oily and greasy which can actually attract dust and dry out the surface. Any surface you wipe down with the Aerospace Protectant Wipes will leave behind a beautiful matte finish and help prevent drying, cracking, and fading from those harmful UV rays. When trying to restore and protect, with simple easy to use no mess wipes then the 303 Aerospace Protectant Wipes are for you. Developed for aerospace and aviation applications, 303 is the World's most effective UV screening product. Restores & maintains a like-new appearance, texture and color. 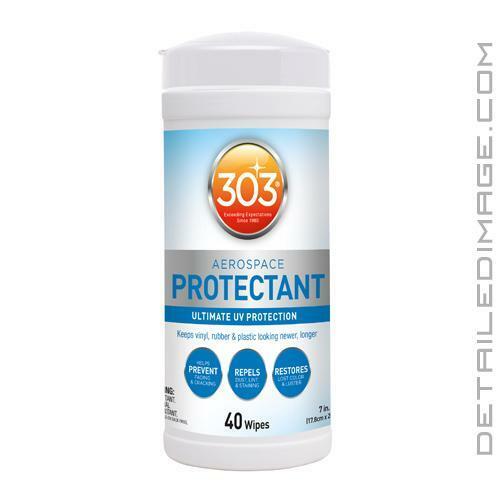 For maximum UV protection, re-apply 303 Aerospace Protectant every 3-5 weeks of exposure. Using the towelette, apply 303 to the area to be protected. With a clean, non-abrasive absorbent cloth, immediately wipe the treated area COMPLETELY dry. INCREASE bonding, repellency and the longevity with extra buffering of the treated area with a dry cloth. 303 Aerospace Protectant protects plastics, vinyl & rubber - Clear Plastics (headlights, taillights, clear vinyl windows) - Fender Flares - Tonneau Covers - Car Bras - Vinyl Convertible Topping - Urethane, ABS, Vinyl and TPO (Thermal Plastic Olefin) trim - Door and trunk seals and under-the-hood rubber - Tires. 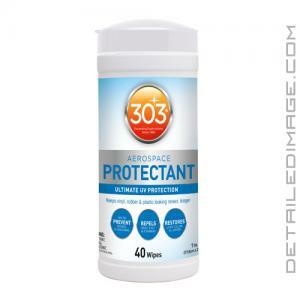 303 Aerospace Protectant is NOT for unfinished leathers (such as suede), fabrics (canvas) or floors. So easy to use on plastics in the engine bay! Leaves a nice shine with 0 residue. 0 overspray! I have the 303 for my convertible top. 303 spray for some smaller areas but was bugged by the overspray into areas I didnt want sprayed. The wipes are a perfect solution for wiping down trim and other things. Highly recommend and highly recommend all your detailing needs should be purchased at Detailed Image. Stellar customer service! !